Add some West-coast vibes to your cookout with guac-featuring California Cheeseburgers. Guacamole and California Cheeseburgers are sure to please! Mix meat and barbecue sauce; shape into 4 (1/2-inch-thick) patties. Grill patties 4 to 5 min. on each side or until done (160°F). Top with cheese; grill 1 to 2 min. or until melted. 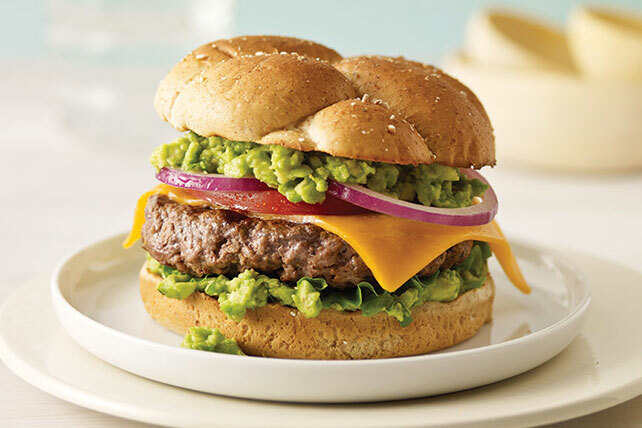 Spread buns with guacamole; fill with lettuce, cheeseburgers, tomatoes and onions. Serve with your favorite fresh fruit. Prepare using BULL'S-EYE Original Barbecue Sauce.